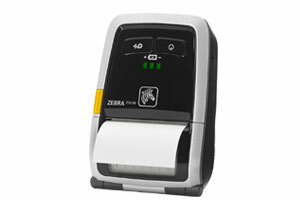 The Zebra ZQ110 Mobile Receipt Printer is the smallest and most affordable printer in zebra's printer line, while also being compact and lightweight enough to fit in your pocket or wear comfortably on a belt for a full work day. Quickly print and tear 2" wide receipts, tickets and delivery notices on site saving your workers time and your business money - all while improving customer service. 2" Mobile Printer, Tear Bar, 203 dpi, 3 lps, Bluetooth 3.0 + EDR, Direct Thermal, 1200 mAh Battery. 2" Mobile Printer, Tear Bar, MSR Reader, 203 dpi, 3 lps, Bluetooth 3.0 + EDR, Direct Thermal, 1200 mAh Battery. 2" Mobile Printer, Tear Bar, 203 dpi, 3 lps, 802.11b/g/n WLAN, Direct Thermal, 1200 mAh Battery. 2" Mobile Printer, Tear Bar, MSR Reader, 203 dpi, 3 lps, 802.11b/g/n WLAN, Direct Thermal, 1200 mAh Battery.